I have a beautiful rosary made by Mary which has beads that are made from "blueberry quartz." It is so comforting to touch, because of the smoothness and weightiness of the beads. Each time I reach for it, I feel strengthened by God. I also have purchased a "USA Chaplet" (with red, white and blue beads) from Mary which I love, because she has also provided prayers for America to be used with the chaplet. I also have purchased an aventurine and glass bead rosary bracelet to be used while away from home. Mary also created a beautiful string of sacrifice beads, which she customized for me with several medals which I requested. The person to whom I gave it, loved it! 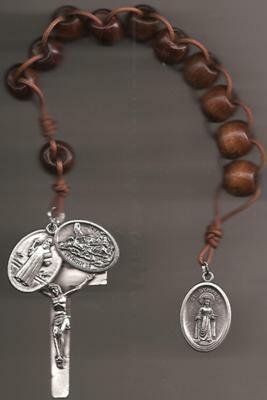 As you can tell, I am really a fan of Mary's rosaries because the materials she uses are so wonderful, and she has so many exciting styles, and she is so willing to work with the customer -- and perhaps most of all, because her website is full of good information about prayers, it just inspires me so. I really do believe that these are "Battle Beads"!